First Met celebrated is 2nd Annual Single Mothers Day, named the Lela Mae and Marion Merlene Day, Sunday, December 14th. 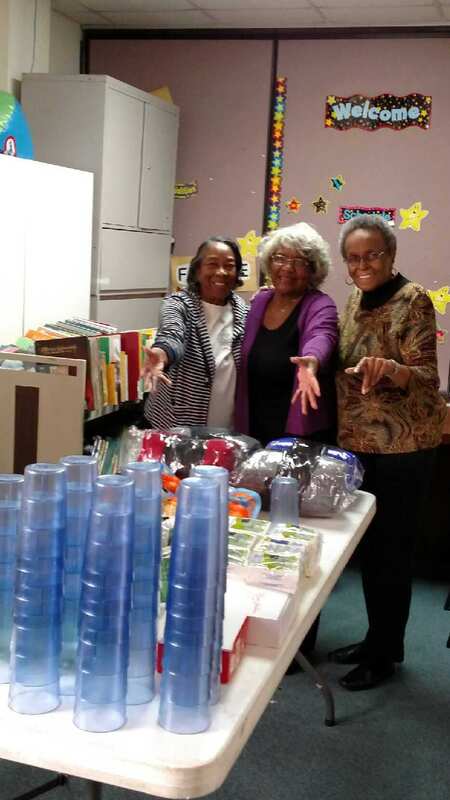 Led by Sister Jeanine Wilson, the members of First Met sought donations from a variety of companies and individuals, to reward the hard work and labor of the Single Mothers of First Met. 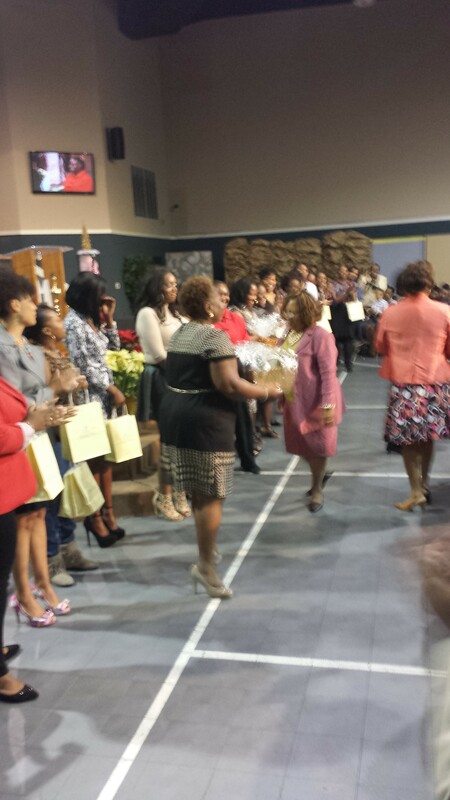 This year, our Single Mother of the Year was Sister Toni Satterwhite! Sister Satterwhite, has dedicated herself to the study and service of the Lord, as well as countless hours pouring into her son. A regular attender of Bible Study, she has been through all sessions of the Women’s Class, as well as the powerful studies during Transformation night with Pastor O. She works closely with the Bookstore as well as KFMC News, and can be found giving her time in the Food Pantry as well. Sister Satterwhite is truly invested in the ministry at First Met, and for that, we are the better. First Met thanks God for all of the Single Mothers that invest in both their church and their homes. These young ladies are aiding in the spread of the Gospel and the shaping of the Saints. Their ability to balance home and church is admirable, and one that can not be overlooked. 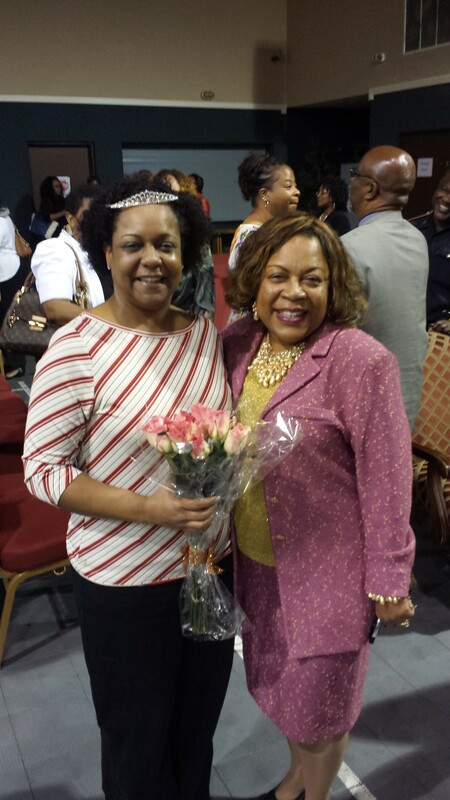 Sister Satterwhite was also able to spend some time with Lady O and the Single Mother of 2013, Nia Abdallah. This past weekend, The Mature Adults came together to make 144 gift bags for the residents at the Woodwinds Lakes Nursing Home. 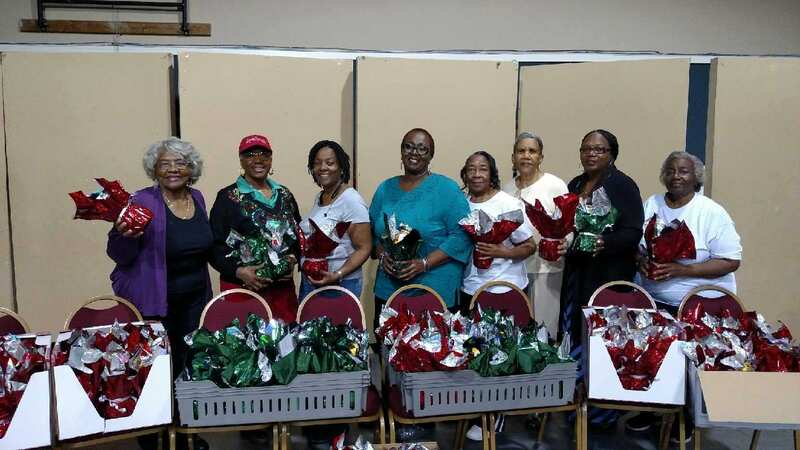 The Mature Adults worked to collect donations from both members, friends and local establishments, putting together bags for men and for women, that contain a variety of toiletries, and snacks. The bags were prepared to bring a smile and to show the love of Christ to the residents, bringing a little holiday cheer to their life span. Our seniors desired to augment what the staff and facility form, as well as add to the powerful worship service that is done each first Wednesday of the month. This month, the seniors will have a special Christmas service on December 20th. The seniors want to thank everyone that contributed to this worthwhile cause. This entry was posted in First Met Event Reviews and tagged FirstMetChurch, Gift Bags, Nursing Home, Pastor O, Senior Bag, Woodwind Lakes. 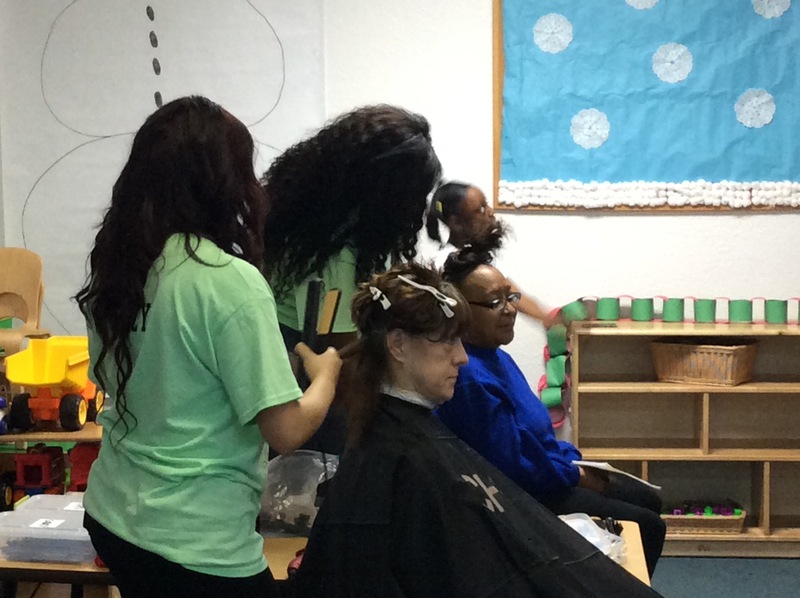 Saturday, December 6th, the Vineyard Bookstore of First Met, sought to bless families in the Northwest Community, by partnering with the Langham Creek Cosmetology Department to offer FREE hairstyles to those being served through the You Belong Food Pantry. Wearing their shirts with their slogan, “it is our duty to create your beauty”, over a dozen young ladies from Langham Creek H.S. used their skills on a men and women of all ages. They ladies served each person, offering them their very best, taking the time to listen, and deliver to them the beautiful hairstyle they desired. 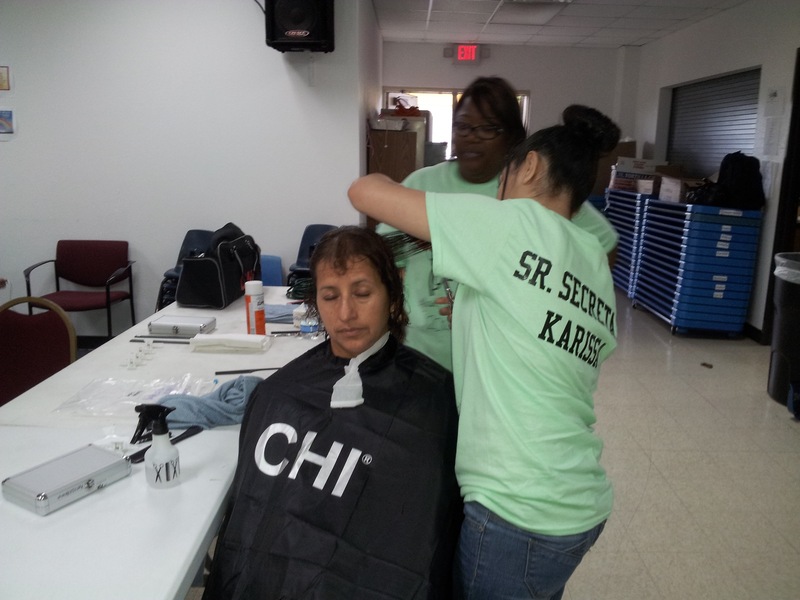 Under the leadership and guidance of Sister Lynette Smith and Mrs. Dillgard, the ladies tackled each person, restoring smiles and bringing beauty and confidence to all they encountered. There, the prayer ministry covered all who attended in prayer, assuring that everyone not only had their physical needs met, but their Spiritual needs met. This entry was posted in First Met Event Reviews and tagged Community, hairstyles, outreach, Pastor O, Service. As you probably know the Christmas Production this year will be brought to us again by the Ensemble theatre! The script is so funny I love it. This message is to seek out anyone interested and available for the role of a TV news reporter! There aren’t very many lines to remember, but it is a significant role. If you are interested and AVAILABLE TO REHEARSE AT THE ENSEMBLE theatre for several rehearsals maybe like 4 or 5, then please write me back and I will give you more information! We are excited to have first met in the cast! There is also a role of an announcer that will not be physically in the play but will be pre-recorded. We are looking for someone with a big radio announcer voice! You will have to attend about three rehearsals to practice the speech and then record. Write me back ASAP if you are interested and available! 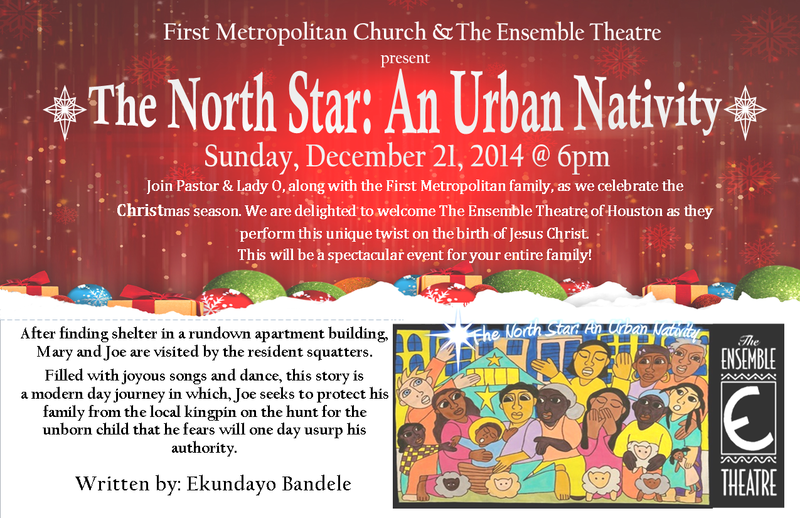 This entry was posted in First Met Event Previews and tagged Christmas 2014, Ensemble Theater, ensemble theatre, Lady O, Michelle Ogletree, Pastor O.
Wednesday at 7:30 PM, the Griefshare Ministry will present Surviving the Holidays. Surviving the Holidays. “GriefShare Surviving the Holidays is a warm, encouraging, and helpful event. Featuring video instruction and group discussion, it helps you deal with the intense pain of grief during the holiday season. To find our more about GriefShare’s Surviving the Holiday, email Sister Harvey at bjtucker-harvey@sbcglobal.net. This entry was posted in First Met Event Previews and tagged Death, FirstMetChurch, Grief, Griefshare, Morning, Support, Surviving the Holiday.